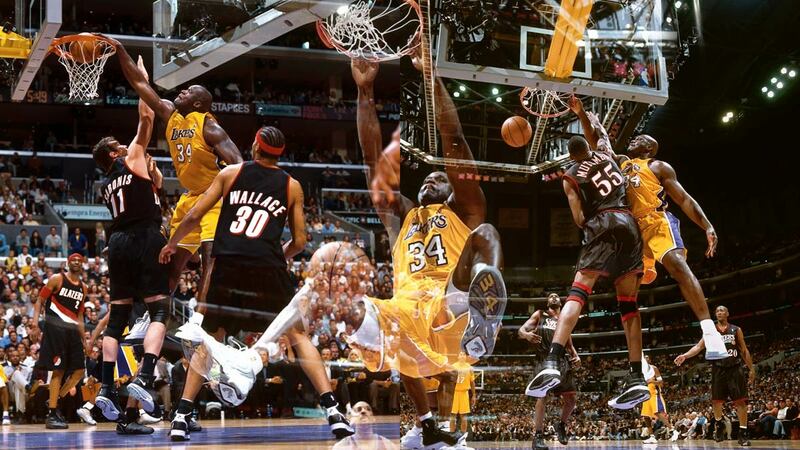 The man with a million monikers, NBA legend Shaquille O'Neal, turned 46 today. It's been seven years since we last saw Shaq on the basketball court (outside of a few pickup games), devouring opponents like they're barbecue chicken. For 19 years, hoops fans witnessed him evolve from being a man-child with the Orlando Magic to becoming a monster with the Los Angeles Lakers, before reverting back to his lovable self in the twilight of his career. Although in his prime, the big fella showed no mercy every time he ran straight into his defenders and put them on a poster. To mark this special day, FHM ranks O'Neal's greatest slama jamas, based on level of insult. Watching this sequence where Shaq dominated almost the entire Nets team gives you an idea of how the 2002 Finals turned out. Quite possibly the only time you'll see the undrafted journeyman's name on an NBA list. The disrespect, dexterity and the victim's obscurity remind us of that time when Shawn Kemp brought out the guns against Alton Lister. This was just one of Diesel's many career highlights that came at the expense of the hapless Blazers. Chief should've listened to teammate Kevin Mchale: "I was in my last year and Shaq's first year. He took off his warm-up in Orlando, I looked at Robert Parish and said, 'It's time for me to go,' ha ha! I went, 'Oh my god, is that guy big and strong and fast!'" The Lithuanian legend may have done better versus Superman if he didn't enter the league at 31 years old. O'Neal did admit that he had the hardest time facing lumbering big men like Sabonis, who actually managed to move him around the post. Even the top rim protectors were no match for the physical marvel that is Shaq, who had the perfect mix of size and speed. He terrorized Mt. Mutombo everywhere the latter went—Denver, Philadelphia, and Houston, where O'Neal returned the favor of the finger wag. Zo made a name for himself with his tenacious defense. Unfortunately, it was also the reason he ended up on the wrong end of posters, mostly courtesy of his highly touted batchmate (Mourning was picked second after O'Neal in the 1992 draft). The Big Aristotle got Olajuwon in a Rockets jersey one too many times, but it was in the 1994 All-Star Game that he straight up murdered the latter. The Dream would get him back the next year, when Houston swept Orlando in the Finals. After missing out on a championship, Shaq vented his frustration on Hakeem's rival, Robinson, during the exhibition match. This would escalate a beef between him and The Admiral, which carried over when O'Neal joined the Lakers. What made this dunk among the most ruthless are the ensuing plays: Bynum exacting revenge on Superman, who didn't like the extra chippiness. O'Neal schooled the LA center so hard that he was out of the league after a few more years. When push comes to shove...literally. This one easily goes down as one of, if not the most humiliating dunk in NBA history.